What products do we mostly import and export? Last year, Malta imported almost double the amount of its exports. 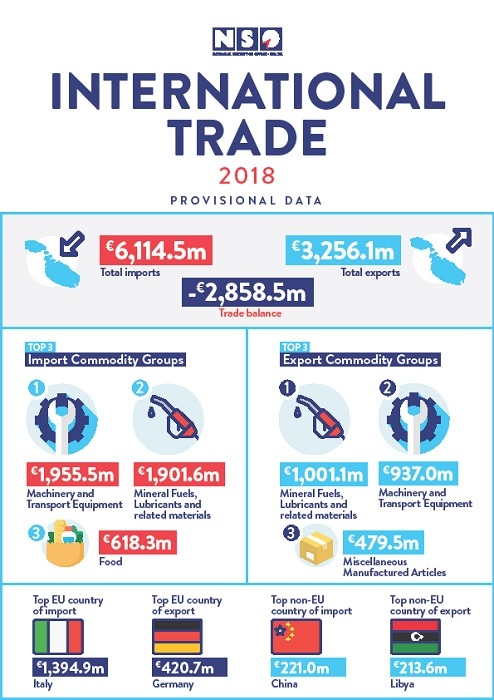 Provisional figures by the National Statistics Office show that Malta’s trade deficit increased by over €400 million last year. Figures show that imports decreased by just over €5 million, while exports decreased by almost €409 million. The trade deficit increased by over €2,858 million. The majority of products imported in Malta were machinery, fuel and food products. The NSO figures show that in its trade relations with European Union members, Malta imported mostly products from Italy and exported mainly to Germany. Trade with non-EU countries was characterized by products imported mainly from China and exports to Libya.